On the occasion of my 50th birthday, a few years ago (yes), my nieces came to Miami to visit me. Ligaya must have been eight. And for years, I knew she was looking at me askance, wondering what was wrong with me. Soon as she learned to speak she was asking me why I wasn't married yet. Once when she was three, she wanted to know if I had put an old boyfriend into time out. "Did you tell him to think about it?" "Did you tell him that even if he thought about it and you disagreed you'd still love him?" He was on permanent time out. So when I turned 50, I took Ligaya and her sisters to my office at the University of Miami. I was now the director of the MFA Program in Creative Writing. I had written several books and had many on the way. The sisters ran their fingers along the spines of all the books. Picked up photos and knick knacks given to me by my students, nephews, and nieces. I thought it was a pretty cool office. After a long moment, she asked me again. "So why didn't you get married?" I'm sure she's not the only person to wonder. I told her that not every woman wants or needs to get married. I told her I was having a great time writing books--because I was--and that it took up a lot of my time--which it did--and that I didn't want to get married just to get married--that was a no brainer. 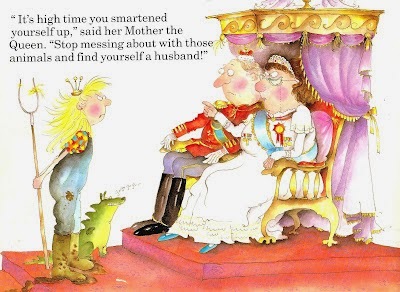 I thought of the book I gave her long ago--it was the story of Princess Smartypants, a feminist take on fairytales, kingdoms and the institution of marriage. I thought I was Princess Smartypants. And in the end, yes, I am. I want it all. I want to be in a job that I have chosen (check) writing books about the stories I want to tell (check) and if I marry (and I will in 30 days) I will do it because I choose to. When I began dating my fiance, Ligaya looked at him and she smiled. When I announced the engagement she said, "Just so you know, the cousins talked about it and we knew it was going to happen."